This is not to be confused with chow mein dish. Lo Mein noodles have a great texture, lot of bite and are flat and relatively thick. Chow Mein noodles are more like wheat vermicelli. Fresh noodles are always so much better then dried variety. Cook noodles till almost al dente, drain, rinse in cold water, drain again and toss with a bit of peanut oil. Slice flank steak very thin and marinade with chopped garlic and ginger, soy sauce, sugar and sake. Prepare vegetables you are using (in my case it was just garlic, ginger, white onions, red pepper and snow peas. Prepare sauce using 1 part each of Hoisin sauce, Oyster sauce and sake and 1/2 part Sriracha sauce. You will need about 1/2 cup for each serving. Once mise en place is done it is very fast. To a very hot wok add peanut oil and brown the beef for about 30 seconds. Remove and keep warm. Into same wok ad another half tablespoon of oil, add vegetables and stir fry for a minute or two. Add sauce, then noodles and reheat. 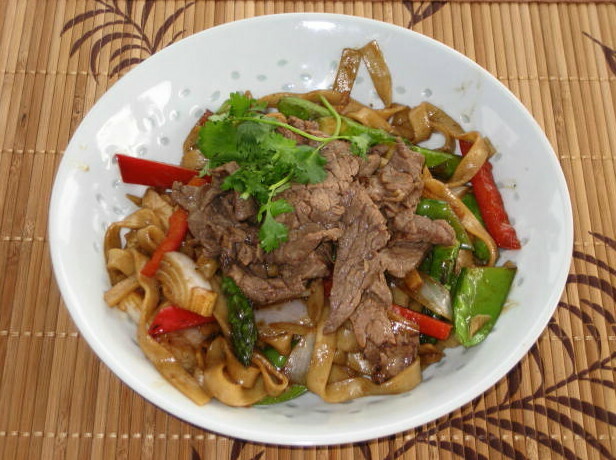 Beef goes back into wok, toss to combine and serve.